5-Ingredient No Bake Nutella Tart made with simple ingredients in less than 30 minutes. It is the “it” treat for Valentine’s Day or just because! Who is going to be your Valentine this year? Mine devoured this 5-Ingredient No Bake Nutella Tart in the blink of an eye. Think about richness and love in an edible form! A great way to say ‘I love you’ even without pronouncing the 3 words 😉 — something that can also be served all year long just because. 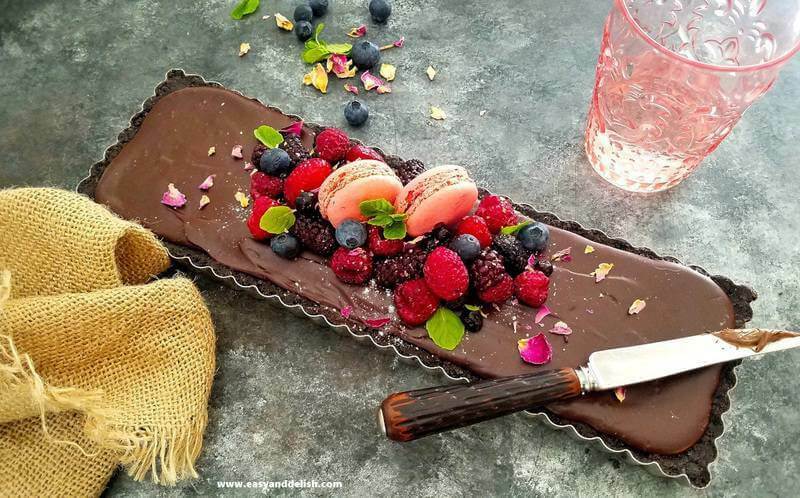 This Nutella tart is one of those impressive treats that are still quick and easy to make. That’s right! All you need are 5 ingredients: Nutella or hazelnut spread, bittersweet chocolate chips, heavy whipping cream, unsalted butter, and Oreo cookies. That means, almost universal ingredients, easily available in most countries in the world. Crumb and combine Oreo cookies with melted unsalted butter and press the cookie “dough” into a tart pan. Then, freeze for at least 15 minutes. Meanwhile, whisk together chocolate chips, Nutella, and warm heavy cream in a medium bowl until obtaining a homogeneous mixture. Pour into the frozen cookie crust and freeze for 15 minutes or until set. See? Easy peasy! 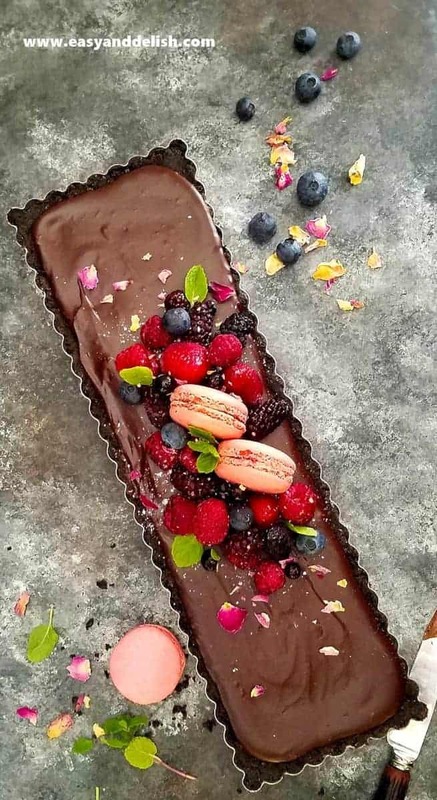 If desired, garnish the top of the Nutella tart with assorted berries, mint, and/or dried rose petals. And there you have a treat fit for the queen or king of your heart. Its luscious flavor is a real declaration of love. A warning though: this thing is ADDICTIVE! You can also surprise your honey and BFF with these other savory and sweet treats too. But of course, our no bake Nutella tart is more than just perfect for Valentine’s Day. It makes a great dessert for Mother’s Day, a Nutella /Oreo/chocolate fan’s birthday party, and other occasions. I plan on making it just because… especially for those days when you just need some happiness in your mouth. 5-Ingredient No Bake Nutella Tart made with simple ingredients in less than 30 minutes. It is the "it" treat for Valentine's Day or just because! 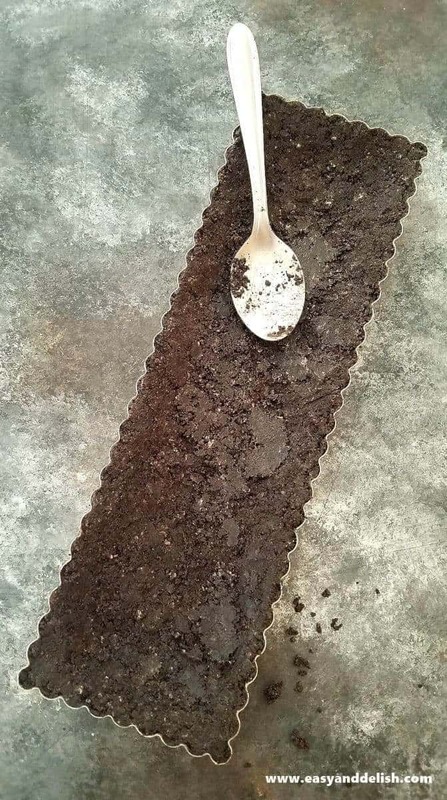 Prepare the crust: Process Oreo cookies in a food processor until finely ground up. Place crumbs into a bowl and mix well with the melted butter. Press into a 14-inch rectangular tart pan (removable bottom) with your hands or with the back of a spoon until evenly spread. Make sure to make edges a bit thicker so it won't crumble once un-molded. Freeze for at least 15 minutes. Meanwhile, prepare the filling. Combine Nutella and chocolate chips in a medium bowl. Pour warm heavy cream over chocolate mixture and whisk until chocolate is completely melted and mixture is homogeneous. Then, pour onto the frozen cookie crust. Place in the freezer for 15 minutes or until set. 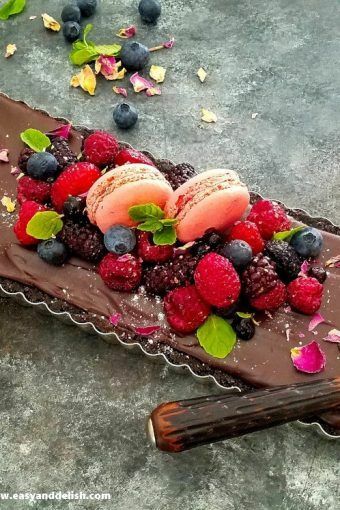 Before serving, garnish top with berries, mint, and/or dried rose petals if desired. Enjoy! Place into the freezer for 15 minutes or into the fridge for 2 hours. This No Bake Nutella Tart can be made up to 3 days ahead of time. You can either refrigerate it or freeze it and then defrost it 1 hour before serving. 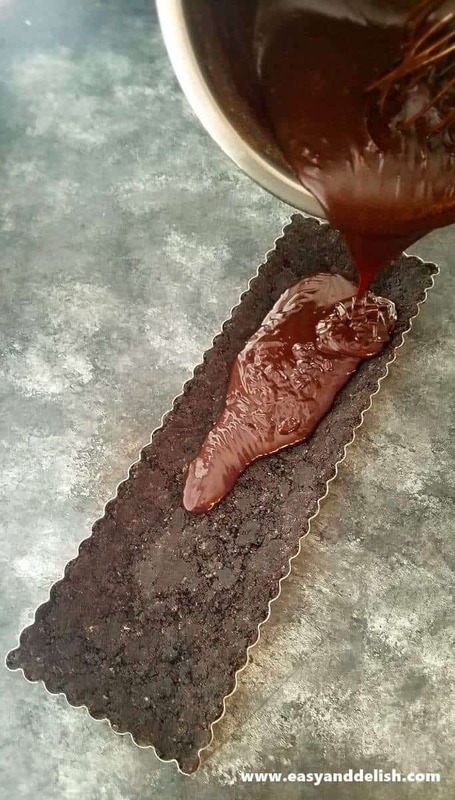 If you don't have a rectangular tart pan, you can easily use a round tart pan with removable bottom. Oh boy ! Since the flu showed to be stronger than me this year, I am recovering and thinking of how to “re-set”. Than you for the solution ! Nutlla rules! Love the stuff. 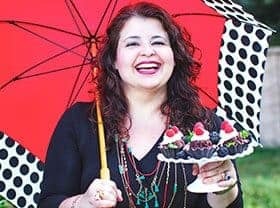 And a no-bake tart? Sign me up! This looks wonderful — thanks. When you crumb oreo cookies, do you include the filling as well? Hi, Steve! Yes, I include the whole cookie. No need to remove the Oreo cookie filling. Enjoy the tart! Hi, Shibi! Welcome and thank you. I hope you have the chance to make this and enjoy. Happy V-Day!